This article has been slightly amended compared to the original posted on Deconstructor of Fun. Starting out as a curiosity back in 2014 and more recently popularised by platforms such as Twitch and Facebook, live streaming has now become a global phenomenon. By providing a completely new way to engage with users, it is becoming the content of choice for content creators and consumers alike on all kinds of platforms. 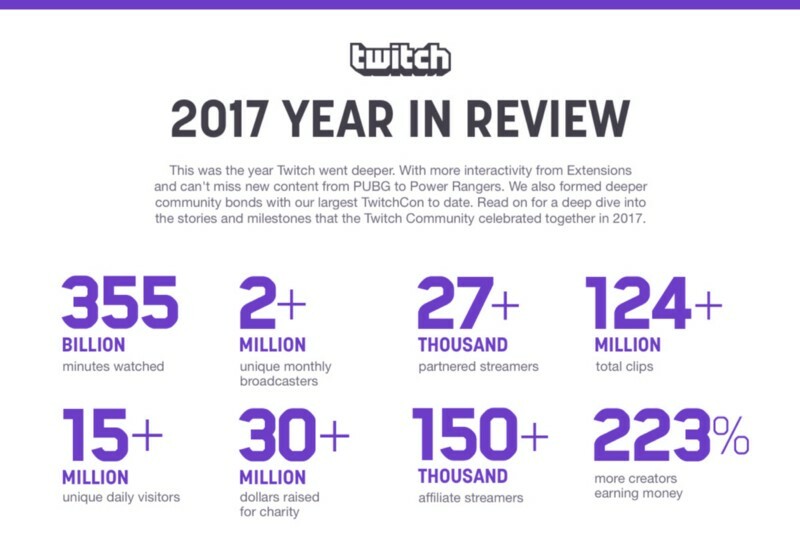 The growth of Twitch in 2017 says it all. We can already see the growing popularity of live streaming in F2P — from influencer marketing campaigns to “Let’s Play” live streams. Fastlane by Space Ape Games included live streamers as main game characters, while Clash Royale continues to promote live stream tournaments in the app. More recently, Pocketgamer.biz announced that Netease’s PlayerUnknown’s Battlegrounds-like mobile game Rules of Survival hosted a special “Players vs Streamers” event on December 17th 2017. Facebook is also following suit by integrating live streaming into their Instant Games. Clearly, the deeper integration of live streaming in F2P games to boost user engagement is just starting. But, most of the above mentioned live streamed content is one-way communication with the content creator plainly delivering information to the consumer. It is interesting to note that Twitch’s solid growth could partly be attributed to their constant rollout of features that incentivise the viewer for engaging with the streamer. So, what if live streams were made two-way interactive and gamified? Published by the Vine co-founders’ (Rus Yusupov and Colin Kroll) new company Intermedia Labs, HQ Trivia is a free to play live trivia game show app (available on both iOS and Android). Streamed live twice a day (3pm and 9pm EST), players get the chance to win real money by answering 12 trivia questions correctly in a TV quiz show setting. When Twitter announced the closure of of Vine, Rus and Colin released Hype — a Periscope-style app for interactive social live streaming. On analysing Hype’s video content, the duo discovered game-show formats to be the most engaging. Pouncing on the opportunity to convert this content type into an interactive app of its own, they created HQ Trivia — a great example of data informed product vision. Intermedia Labs secured an initial round of funding (in the few single digit millions) to help run operations. Interestingly, the funding is also being used for the app’s cash prize money pool — the company’s goal to have a $1 million prize money pool one day. Since the app has no monetization mechanics whatsoever, self-funding prizes is clearly not a sustainable mode and the duo is currently exploring other avenues to fund the prizes. The growing virality of the app is starting to attract the attention of major brands, and the team is considering hosting sponsored games/questions. While HQ Trivia could easily go the traditional TV monetization route of advertising, the co-founders have clearly stated that regardless of the long-term monetisation strategy, they will not let the player experience reach sub-standard levels. HQ Trivia is all about running against time to answer 12 trivia questions correctly to win real cash prizes and move up the global leaderboard. During a quiz round, a participant must answer 12 questions correctly to be deemed a winner and earn a cash prize. The first incorrect answer leads to an automatic disqualification. Winners equally split the prize money pool between themselves and the money is transferred via PayPal. If nobody survives until the last question, nobody gets the prize money and it is carried over to the next quiz round. Winning is quite hard because the questions gradually increase in difficulty. Each question weeds out a bunch of participants, with -20–30% participant drop offs between questions. Unless the tricky “Savage Question” swallows you into its -50% drop off! Each question has to be answered within 10 seconds of it appearing on the screen. This short time limit makes it quite difficult to google answers, thereby curbing cheating. Though that doesn’t stop people from trying, as can be seen in the Google Trends graph below. What makes the above core gameplay fun is the interactive live stream experience. Live streamed content activates the brain in a very different way compared to regular videos. There is a reason why Facebook Live Videos are watched 3x longer and commented on 10x more times than regular videos. According to TV marketing company Koeppel Direct, people engage with live streams for 4 reasons — Suspense from the unpredictable content; Fascination from real people sharing intimate unscripted moments; Fear of missing out (FOMO) a live show; Instant feedback through an interactive layer. To top it off, funny live streamed content is the most engaging and entertaining. While delivering on a fun experience, HQ Trivia is also experiencing rapid user growth — transforming it into an overnight sensation! Let’s look at its key growth drivers. Intermedia Labs’ current focus is to grow users and build its brand. Their first product is doing so magnificently with concurrent users more than doubling over a period of 21 days — 160k on November 29th 2017, 400k on December 19th 2017 and now around 900k. HQ Trivia cracked the top 50 in the overall iOS US charts within a month — a clear testament to the app’s potential. This also ties back to how the co-founders came up with the idea, the potential of which was partially validated given the traction for such content on Hype. HQ Trivia uses a referral code mechanic, where every user could use a unique referral code to invite her friends to the game. For each friend successfully converted into an install, the referrer gets an extra “life”. If the user was to answer a question incorrectly, Lives can be used to continue playing a quiz round. Most definitely, the app has made the process of referral code sharing absolutely smooth and seamless. When implemented properly, in app viral mechanics can be key drivers of user growth. While many F2P games have viral mechanics, they hardly ever prove to be major install volume drivers because they are not closely tied to the core loop and usually provide very ancillary in-game benefits. This is not the case for HQ Trivia. Considering the speed at which question difficulty ramps up in a quiz round, Lives quickly prove to be a very valuable soft currency to get a step closer to the cash prize. The sheer in-game value of Lives greatly drives usage of the referral code mechanic, therefore leading to more app impressions. The legitimizing friend referral plays a key role in converting these app impressions to consequent downloads. Public group play not only drives higher engagement, but also boosts app impressions amongst potential customers in the same surroundings. When talking about group play, Pokemon Go comes to mind. Pokemon Go being a location based game forces players out of the house and indirectly puts them in the view of other players. This would lead to smaller groups of Pokemon Go players hunting for Pokemons together, thereby garnering app impressions with potential customers. Pokemon Go also has the clever mechanic of “Lures” — a game artefact that increases the chance of catching Pokemons at a specific geo-mapped location. When players place Lures at a certain location, it instantly attracts a lot of Pokemon Go players to the same place. This creates rather large crowds and in turn drives app impressions amongst potential customers in the same area. Pokemon Go “Gyms” — geo-mapped locations where players could battle each other — play a similar role. Like Pokemon Go, HQ Trivia also incites public group play — though very differently. HQ Trivia tactfully streams live quiz rounds twice a day at fixed times. Due to the predictable show timings, players are planning for it beforehand so that they can play together — similar to a family gathering around a TV screen to watch a 9pm game show. This is happening both inside and outside homes, in turn catching eyes of potential customers close by. Some offices around the world even stop working when HQ Trivia is on! There is research supporting the fact that TV quiz shows are more enjoyable when consumed in groups (read the research paper here). TV quiz shows not only challenge an individual’s knowledge, but the individual also gets instant feedback on his breadth of knowledge. HQ Trivia brings this experience to mobile, while allowing it to easily extend to groups and thereby delivering a shot of heavy social interaction and fun intelligent competitiveness to further incentivise group play. Being a live streamed trivia game show app, HQ Trivia is not only very familiar territory, but also highly accessible across all kinds of demographics. There is no tutorial, no flurry of game mechanics, no deep meta, no unintuitive UI. Finely finished with a very casual and simple pick up and play design, HQ Trivia has no barriers to entry for participating in the quiz. Tune into the live stream, answer questions, win money — easy. With the referral code mechanic and group play driving app impressions, HQ Trivia’s highly approachable nature acts as a key catalyst for converting all those app impressions to downloads. Not to mention, this app has a very large market potential and it is currently barely scratching the tip of the iceberg. Can HQ Trivia Retain its Growth Spurt? According to Think Gaming data (iPhone US), the application has a strong D1 retention of 65%. Close to 50% of these users continue to play on D7, which is relatively healthy. But, only 50% of the D7 users continue on to D14, which is not the best when compared to standard F2P benchmarks. Further, the app currently lacks content variety, leading to a slightly repetitive experience quite fast. Also, the app is highly optimised for the US audience even though it is available in many more countries. This does not lead to a great app experience across the globe. All three points points are addressable opportunity areas, so as to allow HQ Trivia to retain its current growth trajectory. Let’s explore these a bit. Given the healthy early retention numbers, the app’s unique offering and highly approachable nature seems to be working well. But, the weak long-term retention trend indicates that the strong short-term retention hooks wear off pretty quickly. HQ Trivia should start thinking about the addition of long-term player goals, motivation drivers and retention mechanics to break the cycle. The global leaderboard though is one resemblance of a long-term retention driver. The leaderboard ranks users according to either their weekly total earnings or all time total earnings. At the same time, the dismal quiz round win rates of around 0.02% (in a round of 300k players, there are 30–60 winners) and the fact that only winners earn money makes the leaderboard matter to a very select group of players. Since more than 90% of the players regularly face long losing streaks, this results in a weak sense of round-to-round progression — another contributor to low long-term retention metrics. It will be interesting to see if HQ Trivia turns to the F2P industry for solutions, given how frequently and well these problems have been solved for there. All quiz rounds follow the same format — 2 minute wait before the round starts, host asks questions, winners are showcased, quiz round ends. While this can be exciting the first few times, it does get old long-term. As highlighted before, one of the reasons users enjoy watching live streams is for their unpredictable nature. The element of surprise is lost after a while with HQ Trivia’s repetitive content structure, as users slowly understand what to expect from the video content. Recently, HQ Trivia has started to rotate hosts, which could be a move to counter the lack of content variety. But, something stronger is required and there are many avenues to do so. Currently, the app is fully optimised for a US user base — convenient show timings, english speaking hosts and culturally relevant questions. For portions of the global user base, this translates to quiz rounds starting at 3am, not being able to understand the hosts and unfair questions. Rounds starting at odd times could be the most detrimental though, as it has a major impact on retention and sessioning across the global user base. This also hits long term player aspiration as US users get 2 chances to win money and rise up the leaderboard, while players from some other countries only get one chance or maybe even none. This brings up the interesting challenge of localising the app for its growing global audience. If HQ Trivia takes up solving this challenge, it will be a huge financial, operational and technological undertaking. Further, the longer HQ Trivia takes to solve this problem, the more time competitors have to create clones and start stealing user base in local markets. HQ Trivia’s delayed Android launch is hurting it in exactly this way with clones already starting to capture platform market share. On the flip side, attempting to address this challenge opens interesting new opportunities for HQ Trivia — country specific celebrity hosted shows, culturally relevant sponsoring/advertising, localised hosts asking culturally relevant questions and cracking jokes in the country’s mother tongue at reasonable times of the day? Each of these could be used as key differentiating factors to current and future competitors. Being a one of a kind on the App Store, HQ Trivia is not only in the process of creating a (rather large) blue ocean for itself, but is also becoming an overnight sensation! Its interactive layer has repackaged the typical live stream experience in a very fresh and enjoyable way that can be enjoyed by masses. At the same time, HQ Trivia still has key areas to improve on so that its growth trajectory hits a critical mass in the global market. Will HQ Trivia turn to proven F2P mechanics to solve its long-term retention problems? And will HQ Trivia fuel the rise of live streaming in F2P through deep integration in live operation strategies? Time will tell.